Arsenal could accelerate the appointment of Arsene Wenger’s successor as Mikel Arteta’s rivals for the post continue to be ruled out. Arteta has emerged as the overwhelming favourite to succeed Wenger in the past few days and Arsenal have now interviewed all of the main candidates. Max Allegri seemingly ruled himself out at the weekend by revealing he plans to stay at Juventus, which made Julian Nagelsmann the most serious rival to Arteta. Along with Arteta, Patrick Vieira has been spoken to about the Arsenal post, but the Frenchman has since been left in limbo as he has not received any feedback. Vieira fears he will be overlooked and that his chance to return to Arsenal in a management position has gone. Currently in charge of New York City, Vieira is said to be mystified over whether he has ever been under serious consideration. 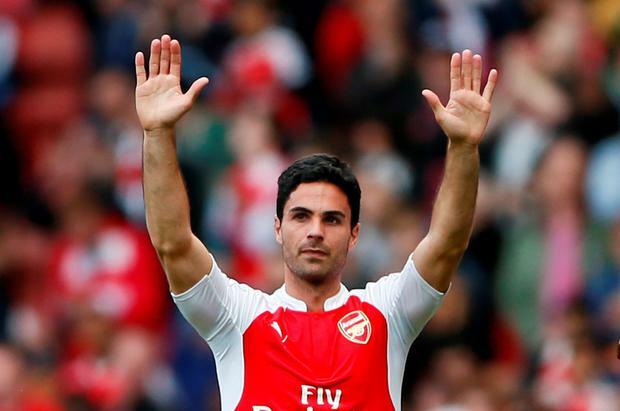 Club sources believe that, barring a dramatic change of heart, Arsenal will now offer the job to Arteta before their previously advertised cut-off point. The only timescale Arsenal had been working to was to make an appointment before the World Cup, but it seems Wenger’s successor could be in place much earlier. Despite the fact they are yet to confirm the identity of their new manager, Arsenal are pushing ahead with a move for defender Caglar Soyuncu from German club Freiburg. Telegraph Sportunderstands that none of the candidates interviewed were asked their opinion of Soyuncu, which further underlines the fact the new man will have to accept Arsenal’s fresh approach to the transfer market. The Gunners are trying to sign the 21-year-old and are believed to be prepared to agree a deal worth up to £35million. A number of Premier League clubs have shown an interest in Soyuncu, but have been told in recent days that he is destined to join Arsenal. Head of recruitment Sven Mislintat has been driving Arsenal’s move for Soyuncu, just as he took the lead in the January deals for Pierre-Emerick Aubameyang, Henrikh Mkhitaryan and Konstantinos Mavropanos, who was unknown to Wenger. All three players have offered encouragement they will be good signings and Mislintat looks set to once again take the lead on Arsenal’s transfer business during the summer. Arsenal could wait for the green light from their next manager before committing to the signing of Soyuncu, but the process points firmly towards the club appointing a young head coach, in the mould of Arteta, rather than an experienced man who would want to take control of transfers. Other than Soyuncu, Arsenal are also looking towards Germany as they search for a new goalkeeper. Bayer Leverkusen’s Bernd Leno, who has a release clause of £22m, is a target.